I didn’t have time to sit down and make out my meal plan this week, but I did know I would need to get some prep work done this weekend. That included going to the grocery store and picking up some veggies (the challenge for me this week is to do a veggie recipe every day) and cooking some chicken that I can use in various applications. Line your slow-cooker with a liner/bag. This helps tremendously with cleanup later. Thaw chicken completely, if frozen. Rinse and pat dry. 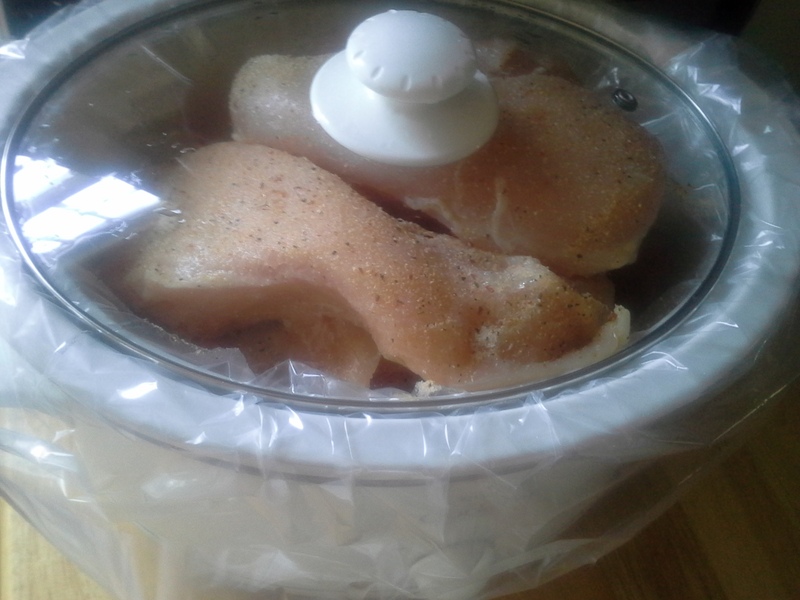 arrange chicken in slow-cooker. 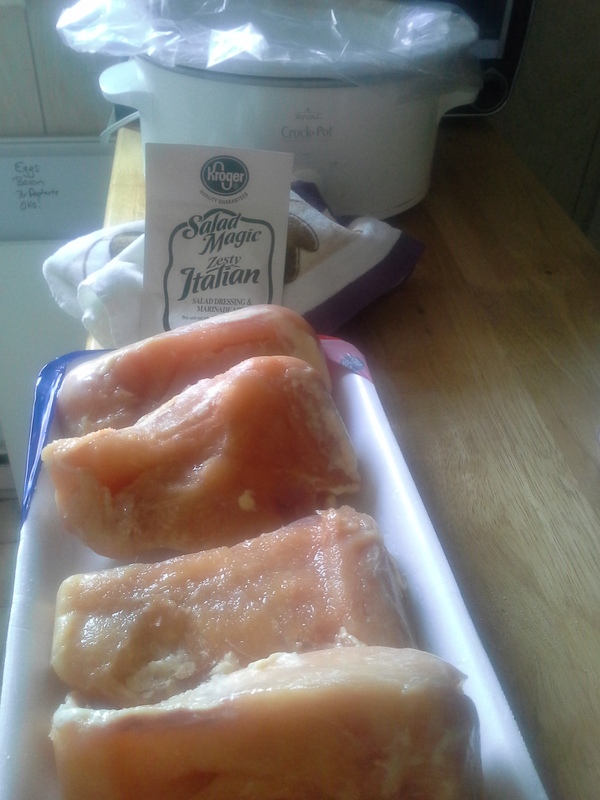 If you need more than one layer to get it all in, season chicken on bottom layer before adding more on top. Use entire package of seasoning mix for approx. 4 lbs. of chicken. Cook on low several hours until chicken is just cooked through. Package each breast separately for use later. 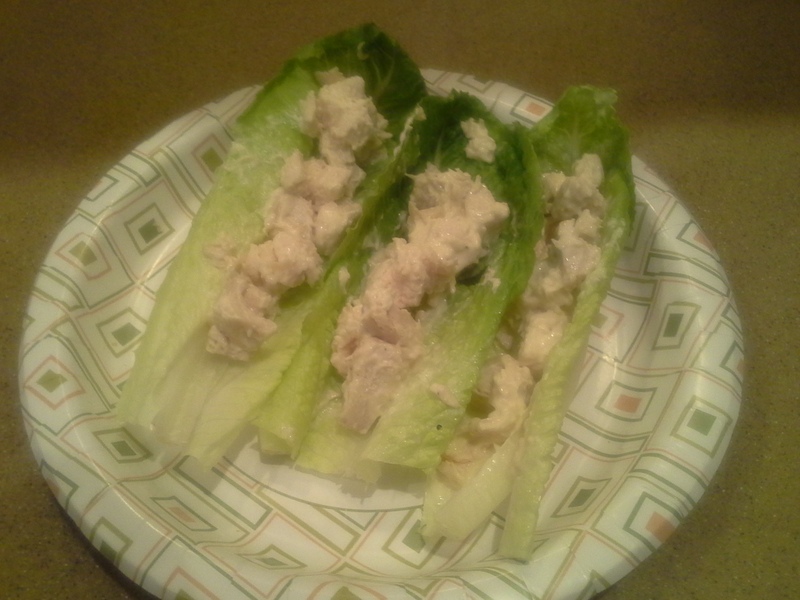 I grabbed one of the pieces from the fridge on my way to work this morning, and at lunch, I chopped it up, added mayo, mustard, and a little prepared horseradish, and now I’m having chicken salad “boats” for lunch. I’ll probably use another one later this week to make chicken and vegetable soup or stir-fry. It’s always nice to have something like this on hand, especially when I’m trying to make going to the gym after work a habit, so that I’m not always having to cook something from scratch when I get home and all I want to do is crash. That sounds good. Saw a roast beef/slow cooker recipe on AllRecipes that called for a package of beef gravy mix, package of ranch dressing mix, and package of italian mix. I have never through to try some dressing mixes to season meat except that Michelle makes a ranch chicken and uses the dry mix. I gotta branch out in my seasoning mixes. Gumbo for supper here tonight.